Students in Robbi Giuliano's fifth grade class sit on yoga balls as they complete their assignments at Westtown-Thornbury Elementary School Monday, Feb. 4, 2013, in West Chester, Pa. The exercise gear is part a larger effort to modernize schools based on research linking physical activity with better learning, said John Kilbourne, a professor of movement science at Grand View State University in Allendale, Mich.
Robbi Giuliano thinks ditching students' desk chairs in favor of yoga balls is one of the best decisions she ever made in 11 years of teaching. Replacing stationary seats with inflatable bouncers has raised productivity in her fifth-graders at Westtown-Thornbury Elementary School, helping students focus on lessons while improving their balance and core strength, she said. "I have more attentive children," Giuliano said. "I'm able to get a lot done with them because they're sitting on yoga balls." The giant rubber spheres, also called stability balls, come in different sizes, colors and degrees of firmness. By making the sitter work to stay balanced, the balls force muscle engagement and increased blood flow, leading to more alertness. 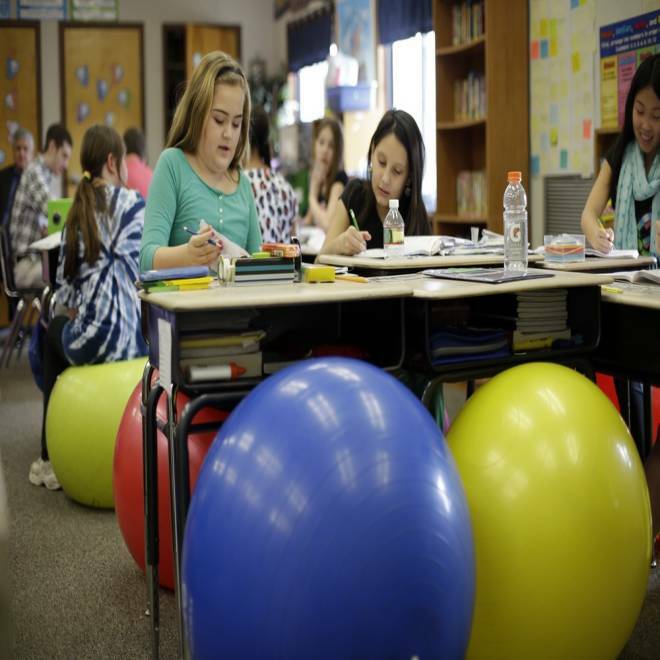 Traditional classroom setups are being challenged as teachers nationwide experiment with yoga balls, footrests and standing desks, which give children outlets to fidget without disrupting class. "It's the future of education," Kilbourne said. Stability balls, frequently used in yoga, Pilates and physical therapy, have even begun appearing in offices after recent studies stressing the dangers of sedentary work environments. The balls first began to surface in schools as aids for kids with attention problems or autism, said Michelle Rowe, executive director of the Kinney Center for Autism at Saint Joseph's University in Philadelphia. The equipment has since gone mainstream. "It takes away the taboo of wiggling, which most kids do anyway," said Rowe, who also is a professor of health services. Giuliano began using the balls in her class in West Chester, a Philadelphia suburb, about three years ago after her husband mentioned how they increased productivity at the holistic wellness company where he worked. Student Ashley Hasson conceded that adjusting to her dark pink ball was tough at first. "But once you get used to it, it's not that hard because basically you're just sitting down," she said. Another student, Kevin Kent, said the ball makes it easier for him to concentrate and keeps his back from getting stiff. Now, he said, sitting in a chair is "weird, because you're all bent up." Some health experts cautioned against the possibility of student horseplay and falling off the balls. But Giuliano's 24 students know they must keep their bottoms on the balls and feet on the floor at all times, though they can bounce and bob as much as they like. The same goes for Dannielle Doran's fourth-graders at Merion Elementary School in a nearby district, where misbehavior risks loss of the ball and a return to a four-legged seat. "They like sitting on them so much, and they don't want to lose that privilege," Doran said. "It seems to almost ... motivate better behavior." At Namaste Charter School in Chicago, which is guided by the philosophy that healthy and active kids perform better in class, all students learn to use stability balls during physical education. Yet they're used as seats in academic settings only on a case-by-case basis, principal Allison Slade said. "Fifth-graders are so antsy that, for some kids, this is really good for them," Slade said. "But for others, I think it could be really distracting." To be sure, the balls are not mandatory in Doran's or Giuliano's classes, but Giuliano noted only one student in three years has opted to continue using a chair. Parents have been supportive as well, voluntarily purchasing the $5 balls for their kids. Some even ended up buying balls for themselves to use at home and work, said Giuliano, who wants to spread the word to other teachers. "I don't like sitting on a chair all day ... so I started sitting on a yoga ball, and I find I'm more alert," Giuliano said. "And my message is to try it with your class and see if it works for you."